The HaT solar telescope large backfocus allows to use multiple etalons, focal reducers and binoculars. 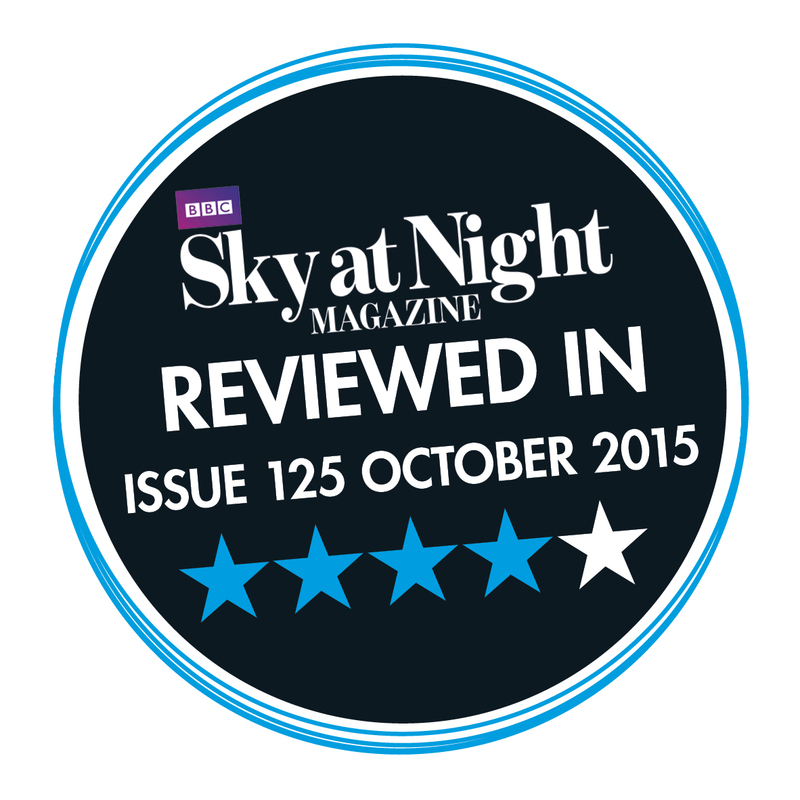 For the first time on the market, Airylab proposes a large aperture telescope dedicated to our star ! The HaT is designed for the observation and imaging of the Sun in four bands : Continuum (540nm), Sodium (589nm), Helium (587nm) and of course Hydrogen Ha (656nm). You will access to true high resolution with the HaT solar telescope. And it is compact, safe and an affordable ! Leveraging Celestron’s proven design EdgeHD C8, C9.25 and C11, we apply a specific di-eletric coating to make an ERF out of the corrector plate. An included amplifier shapes the rays for the Fabry Perrot etalons (etalon is not provided). 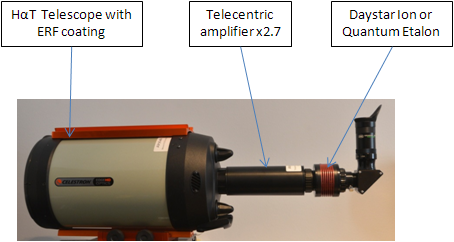 We designed this telecentric amplifier specifically for the HaT using the leading ZEMAX software. Thanks to its performances, you can use most of the unobstructed etalons of the market up to 48mm in diameter. Actually if you own a simple PST, you are ready to use a HaT. The telecentric brings the F/D number to 27,5. An optional F/35 upgrade is available for large pixels and very good seeing conditions. The HaT doesn’t transmit the CaK calcium UV band for two reasons : going down to UV would allow too much energy in the telescope to reach the maximum resolution, and the Schmidt-Cassegrain telescope is by design not optically good in UV band due to the spherochromatism. 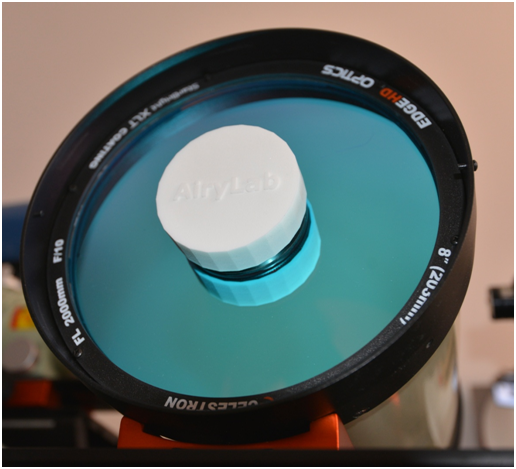 You will observe with Airylab’s HαT large aperture the Sun’s most difficult figures such as small spicules and umbral dots. 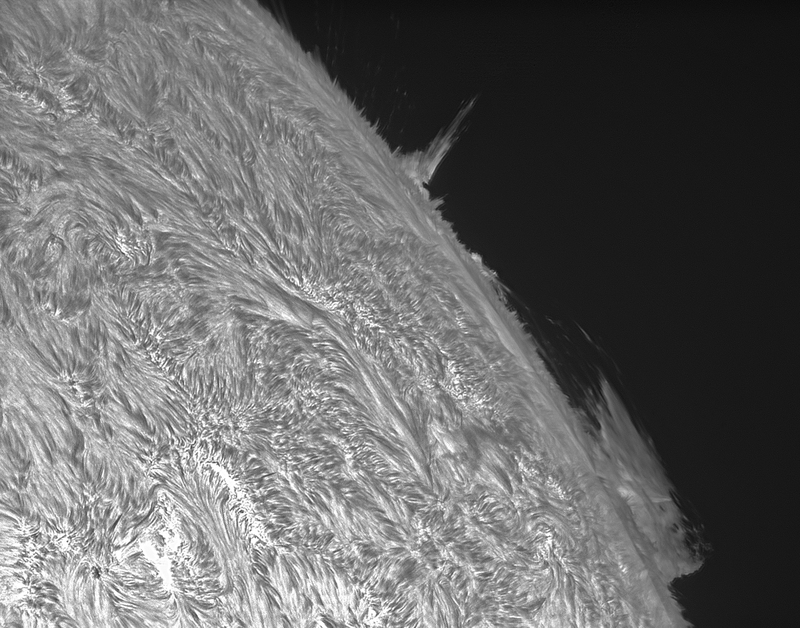 The HaT also delivers great details in prominences and inside the surface’s spots. In continuum band the granulation is easy and the spots very detailed. The back focus ranges from 100 to 300mm without impact on the optical performances. As a result you can use whatever etalon stacking combinaison and even a binocular head without its amplifier ! You can use a large choice of Ha etalons with the HaT solar telescope. That includes solid mica etalon such as Daystar Quark combo, Ion or Quantum or Solar Spectrum Solar Observers, but also air spaced etalon without central obstruction from Coronado (PST) or Lunt. Hence if you already own a Daystar or a Solar Spectrum, you just need to screw it on the telecentric to use the HaT solar telescope ! You will also use the solar telescope for photosphere observation in red or continuum spectrum with additional neutral density filter. In that regard it works the same way as an Herschell wedge on a refractor. We measure the Celestron telescopes we build the HαT solar telescopes with on our professional optical metrology platform. Controls are performed before and after the ERF coating and the solar telescopes are guaranteed to be better than L/4 for the Ha band. Therefore we ship each telescope with its metrology report for optical quality and ERF coating transmission. The aplanetic design delivers a large corrected flat field that is very tolerant to collimation. For example on the 203mm model, telecentric amplifier corrects the field on a 0,25° radius which is Sun’s full disk size. Consequently the performance is diffraction limited over the full field of a large Daystar Quantum or even the larger 46mm research grade Solar Spectrum etalon. Thanks to the ERF the secondary mirror stays cool and a customized white plastic cap protects its support from the direct exposition to Sun’s light. The ERF’s di-electric coating is hardened and can be easily cleansed the same way as for a non coated plate. The HaT ERF coating protects the equipment from thermal load and suppresses internal turbulence. The corrector is hard coated with an Ion Beam Machine. Unlike the solar refractors that get big and clumsy above 150mm, the HαT solar telescope is small. 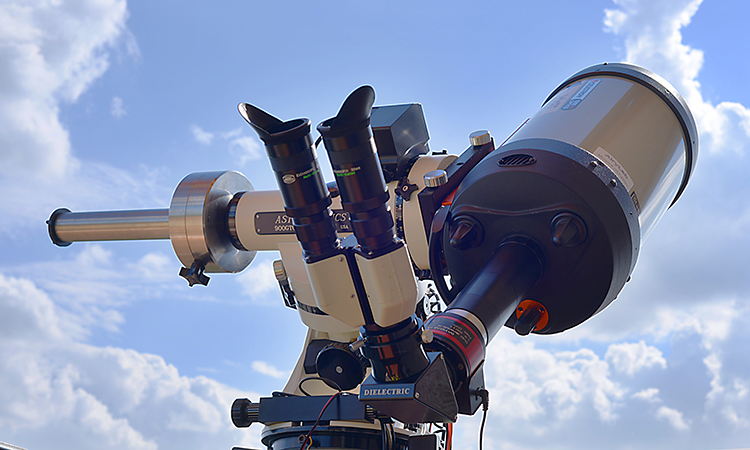 The 280mm version – the biggest solar Ha telescope on the market – is transportable and fits on an EQ6 mount. The small 203mm fits on a light mount and shows a very stable alignment even after an extended ride in the car. Thermal equilibrium is quick and the telescope is ready in less than 20mn at worst. The observation position on this short OTA is comfortable even when the sun is at the zenith. The closed tube design limits the heat exchange with the outside and the internal turbulence. With a couple of double stacked PST etalons the bandwidth tuning is very easy and falls just under your hand. So does the focus knob. HaT optical design with the in-house designed telecentric amplifier. 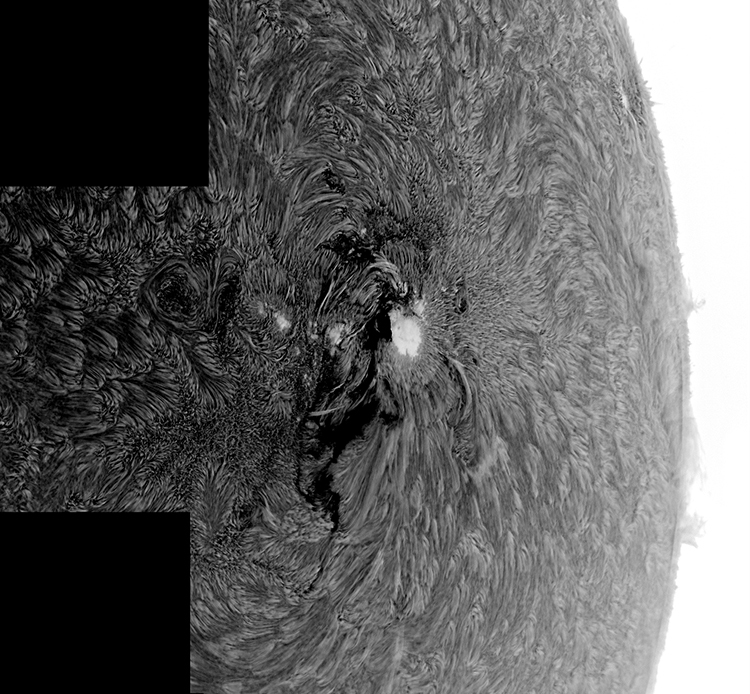 World class solar imagers have already brought HaT to the resolution limit, proving that the whole design is flawless ! 203mm : €4800 inc. VAT within EU, €4000 outside EU. 235 and 280mm : please contact us. Prominence and spicules in September 2014, Basler acA1920-155um camera, PST etalon. 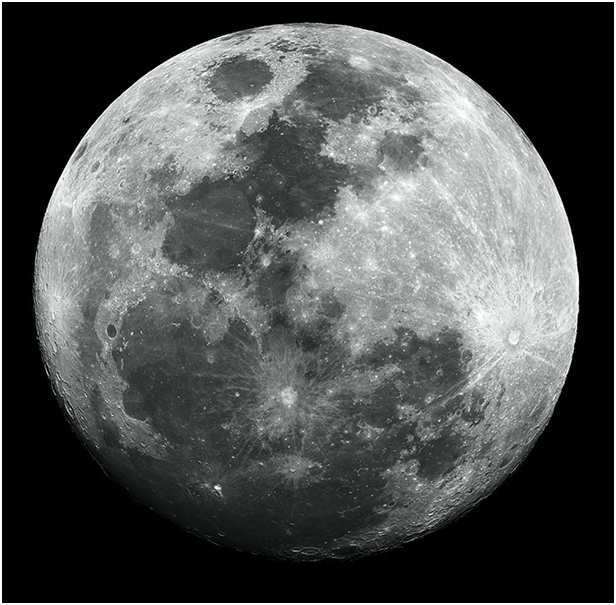 Moon at HαT native focal length. No filter.